The Atari VCS (aka Atari 2600) was a fantastic machine back in 1977 and gave many years of fun around the world. 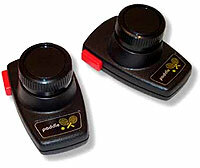 This was many people's first experience of accessible gaming too thanks to Atari's "Special Feature" game variations, difficulty level switches and easy to adapt game controllers. 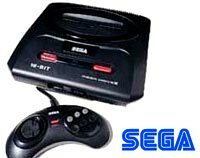 Thanks to the variety of game controllers that were released for the Atari during its life time there are a range of ways that these games can be played under emulation. Almost all games can be played using the keyboard with some 'paddles' compatible games being playable with a mouse controller too. The Atari 'Stella' emulator is certainly a step-up in complexity from the RCA Studio II emulator, giving many more options to the user. Below gives a basic run down of how to get started. More advanced users may wish to jump in with the full instructions here. Download then install the latest "win32.exe" Stella Emulator. You can download "Cave 1K" for an initial test if you like which is a tricky one-switch helicoptor game. Right click on the link above then save within the "ROMS" folder found by navigating to your C: drive then to "Program Files" then to the "Stella" folder. Restart Stella and you should see the game appear. Trouble Shooting: If your game does not appear after restarting, then you may need to point Stella to the correct folder. Go to the "Options" menu then "Config Files" then click on the "ROM Path" button. From here you should be able to navigate to the correct folder where your game is located. Atari 2600 land: A few hacked games including Space Invaders with infinite lives. Most games on the Atari VCS had to be started by pressing the "game reset" lever on the actual console. Likewise, game variations need to be selected using the "game select" lever, and so on. See below for more of the controls you will need. TAB = Bring up the Options Mode window whilst playing a game. F12 = Take a game screenshot for use at the game navigation window. The Atari allowed for quite a wide range of controllers to be interchanged. 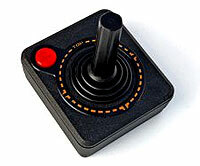 Most games use a digital joystick with a single fire button. Many other games such as Super Breakout use a rotary 'paddle' controller. CTRL or SPACE (fire button). LEFT, RIGHT cursor keys and CTRL or SPACE (fire button). UP, DOWN cursor keys and 5 (fire button). It is quite easy to reconfigure game controls from the "Input Settings" accessed via the Options screen. This will be essential if wishing to use a 4Noah game utility. I recommend setting the Player 1 joystick controls to act as the numeric keypad arrows and using "Z" for rapid-fire duties. Note: Stella and 4Noah do struggle to work well together at times so you may need to tinker with the timing settings.